Mexican Street Corn is my new favorite side dish. 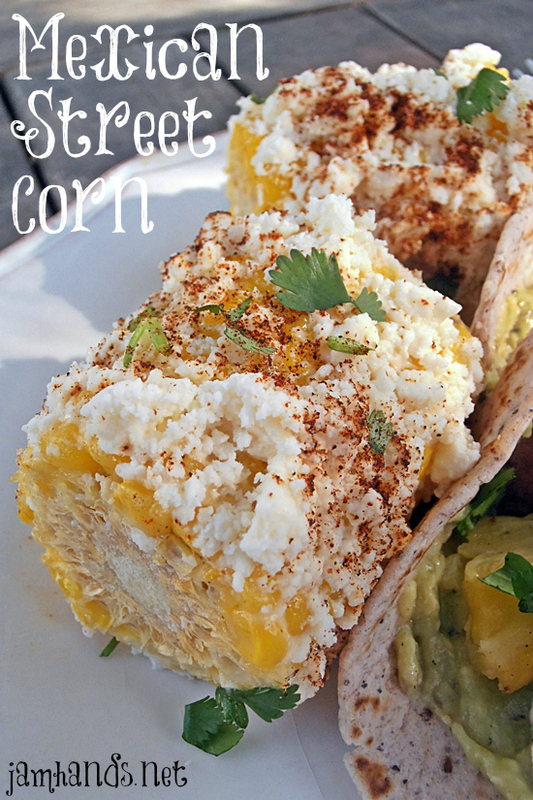 It is a very simple dish, basically corn is prepared and then rolled in yummy toppings. What isn’t to love? Queso Fresco is a very mild crumbling cheese found in most grocery stores. My Queso Fresco came as a solid round shape but it very easily crumbles into smaller pieces. Enjoy! 1. Preheat oven to 400-f degrees. Brush corn lightly with butter and sprinkle with salt and pepper. Roast 20-25 minutes. Alternatively you can grill or broil the corn. 2. Working with one ear of corn at a time, brush with mayo. Roll the cob over the cheese and sprinkle with cilangro and Ancho chile powder, pressing the toppings into the corn so it adheres. Sprinkle with more salt and pepper if desired. Serve with lime wedges. Slightly adapted from Cinnamon Spice & Everything Nice and Saveur. Sharing this recipe at the following fun link parties. Love this. In El Paso one can buy this from stands or food trucks. The smell is so tempting. Thanks for sharing a recipe I can make at home. Ahhh this looks so good!! :) I've never heard of this. Saw this on Mom Spark, searched for it this morning, pinned it, bought the ingredients, and making it for dinner tonight! !